I went to Canada without any definite plans. I set aside ten days in late September/early October, and just figured that I would play it by ear. We’d climb whatever was in condition. 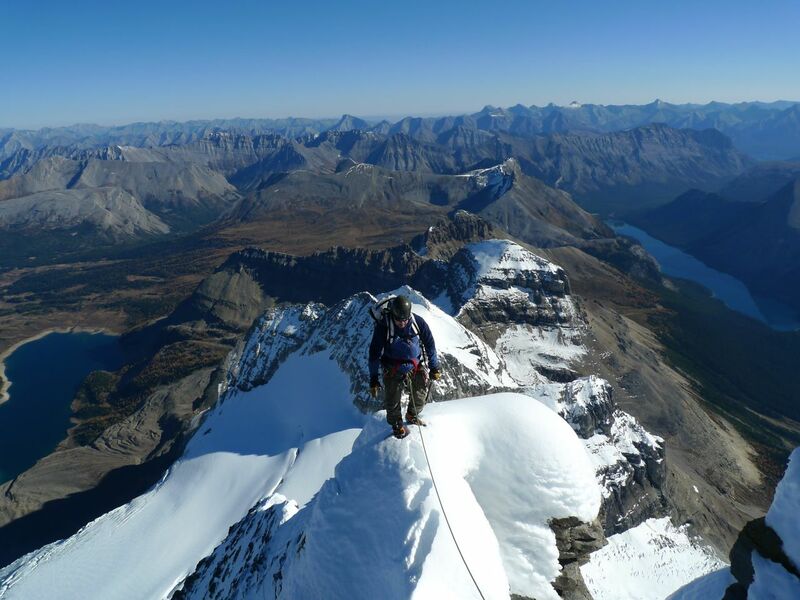 I hired a guide for the trip, partly because I didn’t really know anyone who could take a 10 day trip to Canada, and partly because I really hadn’t climbed anything big in a while, and wanted the added security and assurance that a guide brings. My guide for the trip was Barry Blanchard, the renowned Canadian hard man. It’s pretty cool that I could actually climb with someone of Barry’s stature and reputation. Kind of like having Michael Jordan as your basketball coach. I arrived in Canada at the end of September. Winter had come early to the mountains, after a cold and wet summer season, and this limited our options. I’d hoped to do a big north face, on Robson or Clemenceau, but harsh winter conditions made these objectives unfeasible. 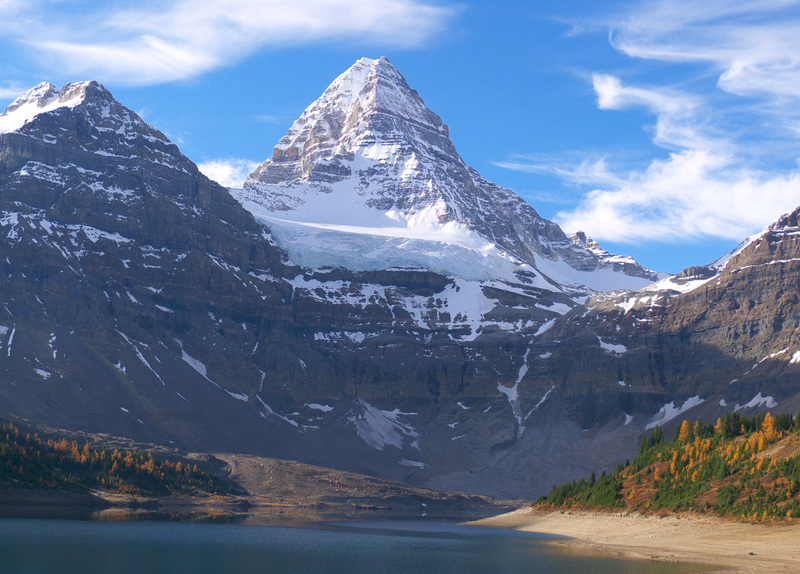 Instead, we opted for an attempt on Mount Assiniboine. It’s a beautiful mountain, and both the North East Ridge and North Face routes would provide a good challenge in these conditions. 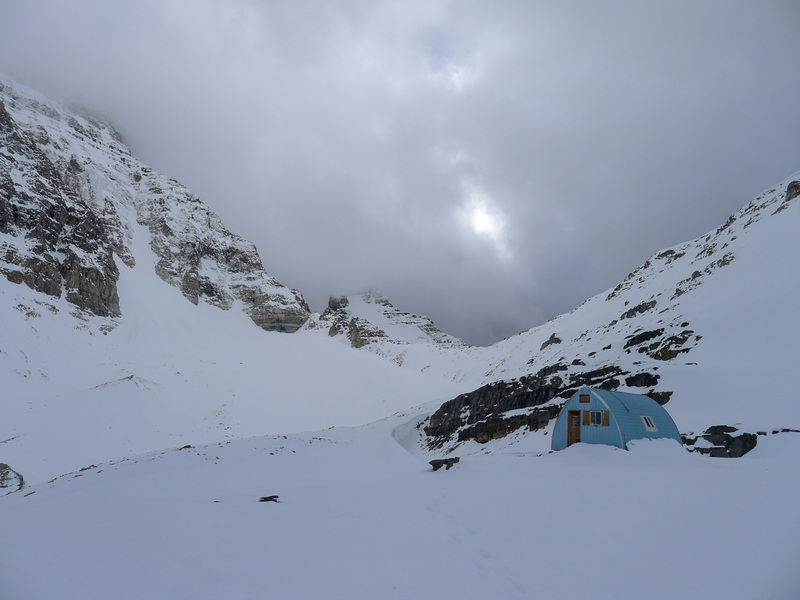 We took a helicopter to the Assiniboine Lodge, and then made the four hour hike up to the Assiniboine Hut, a somewhat Spartan shelter situated near the base of the mountain. 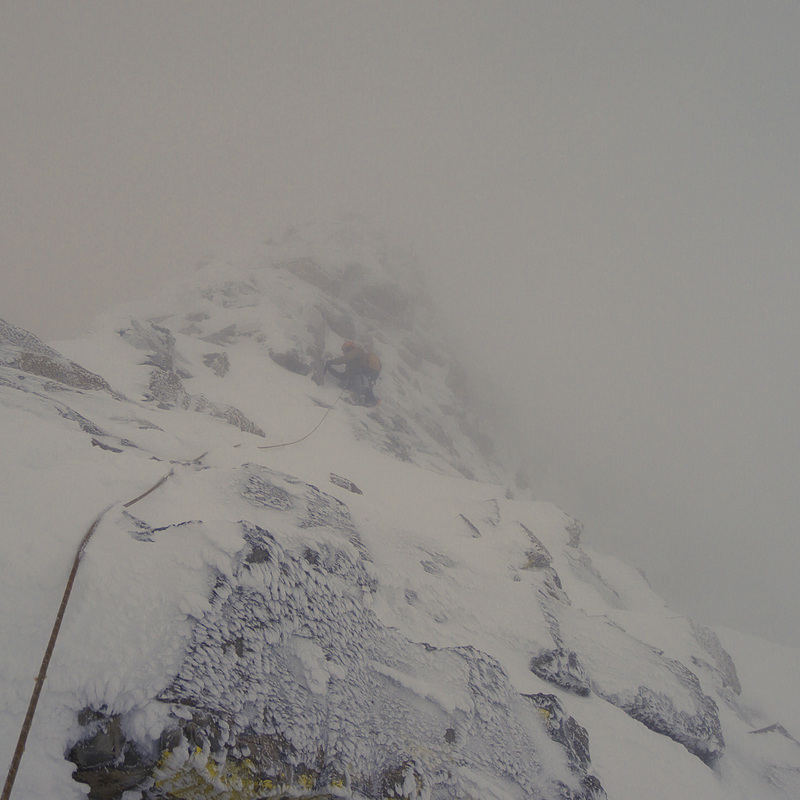 Next morning, we headed out for an attempt on the North East Ridge route. It was rather tough going. 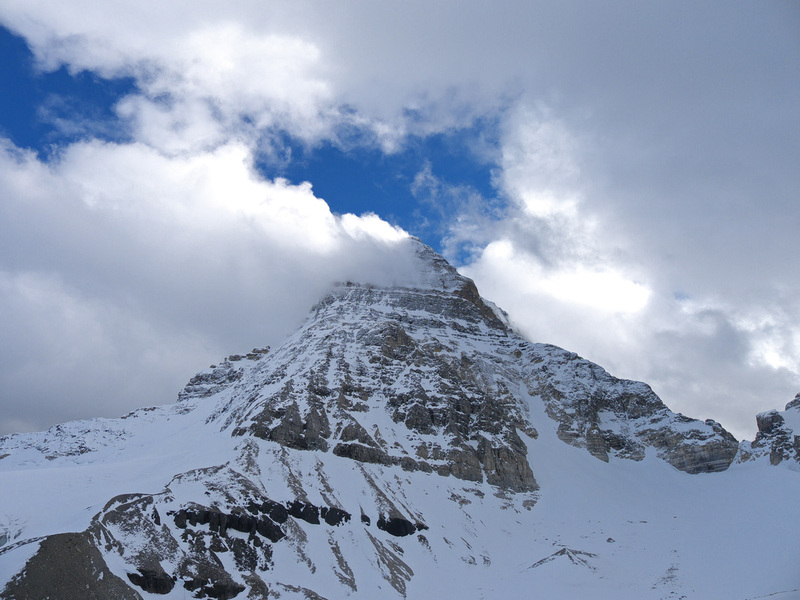 The mountain was covered in snow and ice, but the biggest challenge was the wind. It pounded us constantly, with gale force gusts that made climbing and communication difficult. 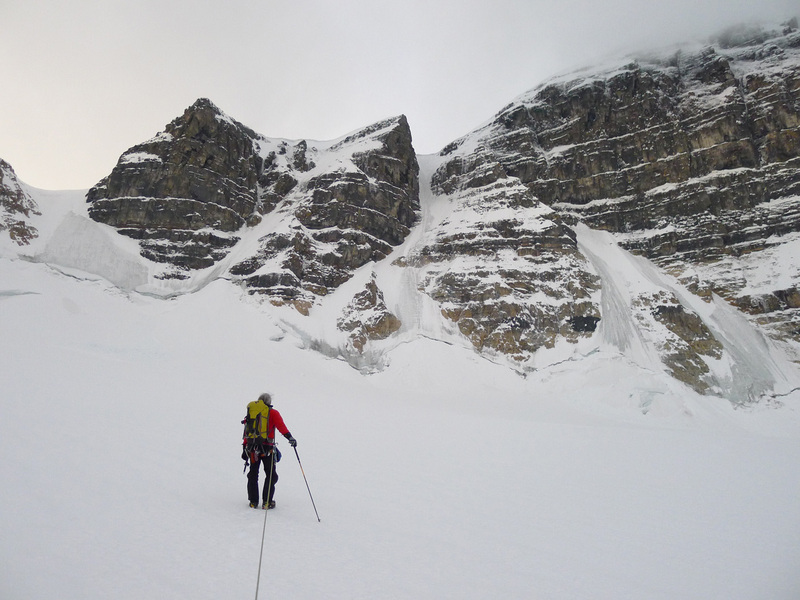 We climbed through the first two large rock bands on the ridge, (the Red and Gold bands,) The climbing was mixed, on snow and ice covered rock. 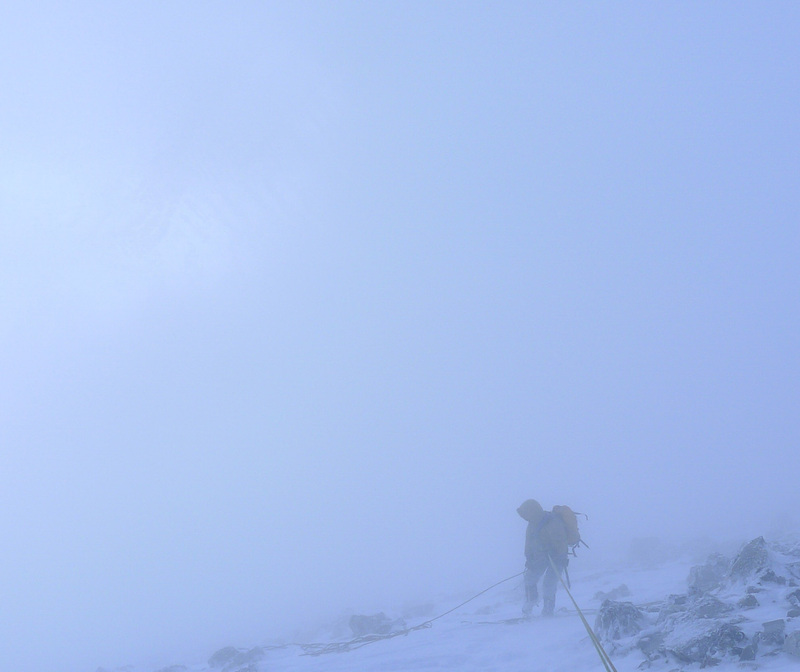 Visibility was very poor, and wind gusts were slinging snow, ice and gravel through the air. The clouds swirled around us madly. I watched Barry climbing up the rocky face, balanced on his front points getting battered by the wind. It looked a pretty sketchy. When I topped out on the Gold Band, I asked Barry, “How are we doing?” I was relieved when he said he thought it best that we retreat. We spent the next few hours getting off the mountain and back down to the Hut. We made plans to make another attempt on the ridge the following morning, but the next day, the weather was just as bad, if not worse. We ended up hiking back down to the Naiset Cabins next to the Assiniboine Lodge in a heavy rain. By the time we reached the Lodge, I was soaked through and completely demoralized. However, the proprietor of the Lodge was an old friend of Barry’s, and granted us the hospitality of the Lodge. Barry and I enjoyed a royal dinner, a hot shower, and a stint in the Lodge’s sauna, which did much to raise our spirits. We also dried out our gear using the wood burning stove in the Naiset cabins where we were staying. At dinner, we were offered the opportunity to hitch a ride back up to the Assiniboine Hut on a helicopter that was making a scheduled maintenance run to retrieve empty propane bottles and a full latrine barrel. 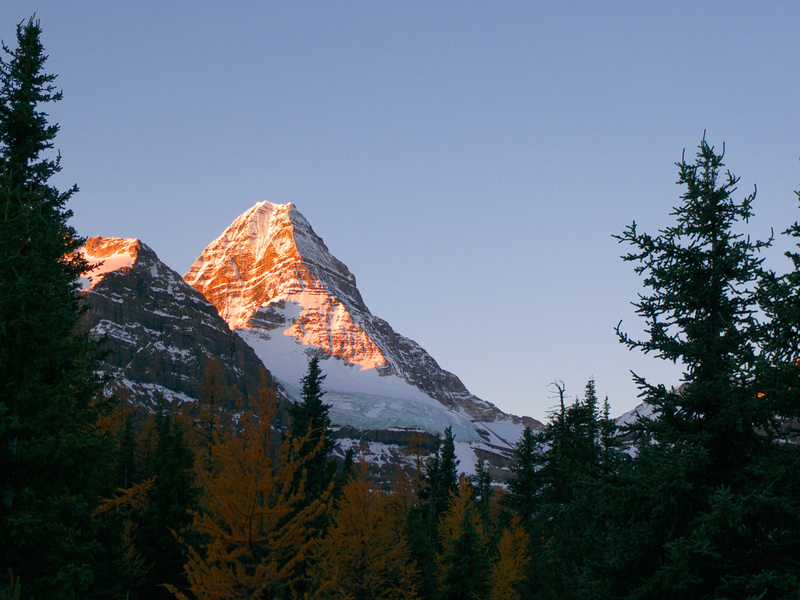 The offer of a helicopter ride, coupled with the favorable weather report for the next two days overcame our reluctance, and we decided to give Assiniboine another shot. The weather turned for the better, and our summit attempt was undertaken under clear blue skies without even a breath of wind. It was a stark contrast to our windblown, somewhat desperate attempt a few days earlier. Snow conditions were perfect, with excellent cramponing up firm neve. The climbing was still challenging, but much of the verglass on the rock was gone, and we didn’t have to contend with the wind blowing us around. We reached the summit at around noon, and were treated to amazing views in all directions. We decided to rappel down the North Face rather than downclimb the ridge, and we spent the rest of the day descending back down to the hut, where we spent the night. 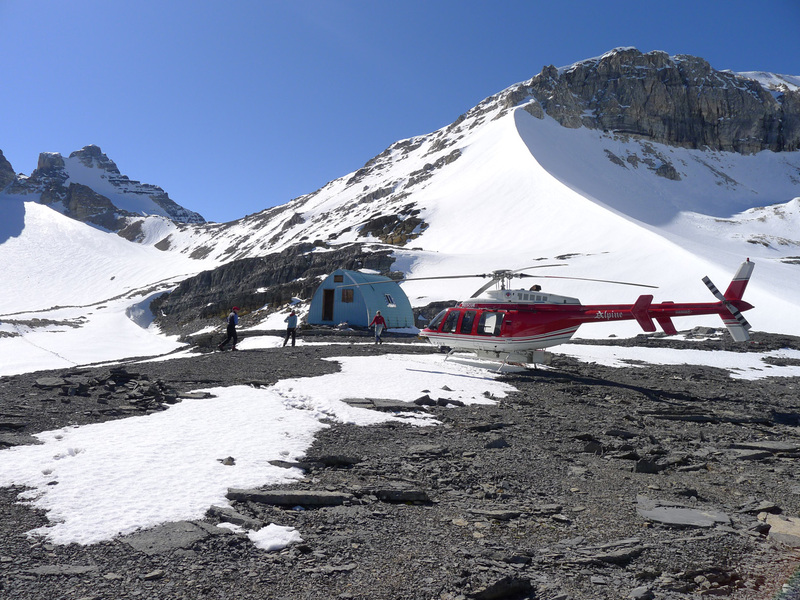 The next day, we hiked back down to the Lodge, and caught a helicopter flight back to our car. I was running out of time, but wanted to get in some alpine ice climbing. 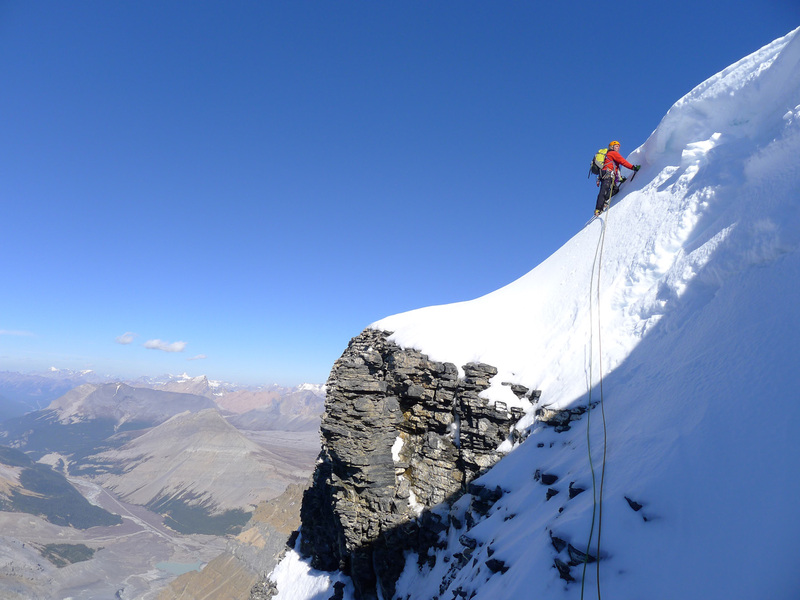 As I told Barry, I wanted to “swing my ice tools, and kick in my front points.” So, after a day of cragging at Lake Louise, we took off for the Columbia Icefields, to climb a route on the flanks of Mount Andromeda. 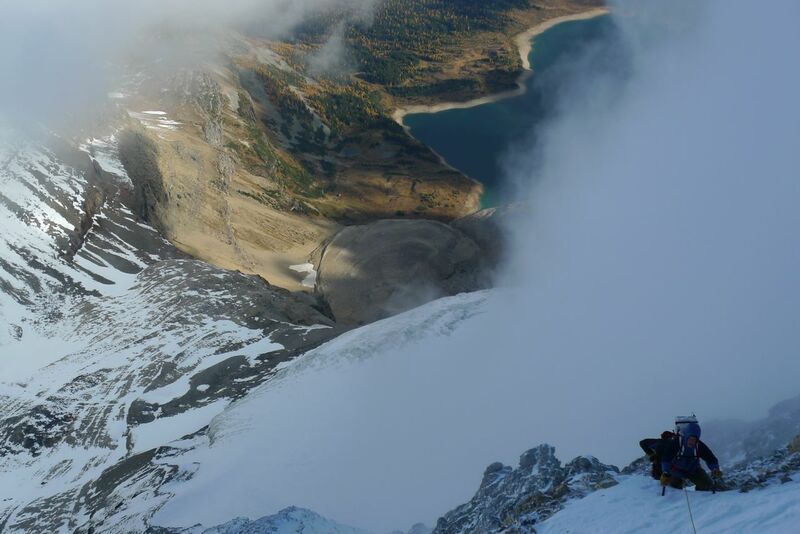 The route is referred to as the Middle Practice Gully in Sean Dougherty’s guidebook, but Barry calls it the Middle Earth Gully. 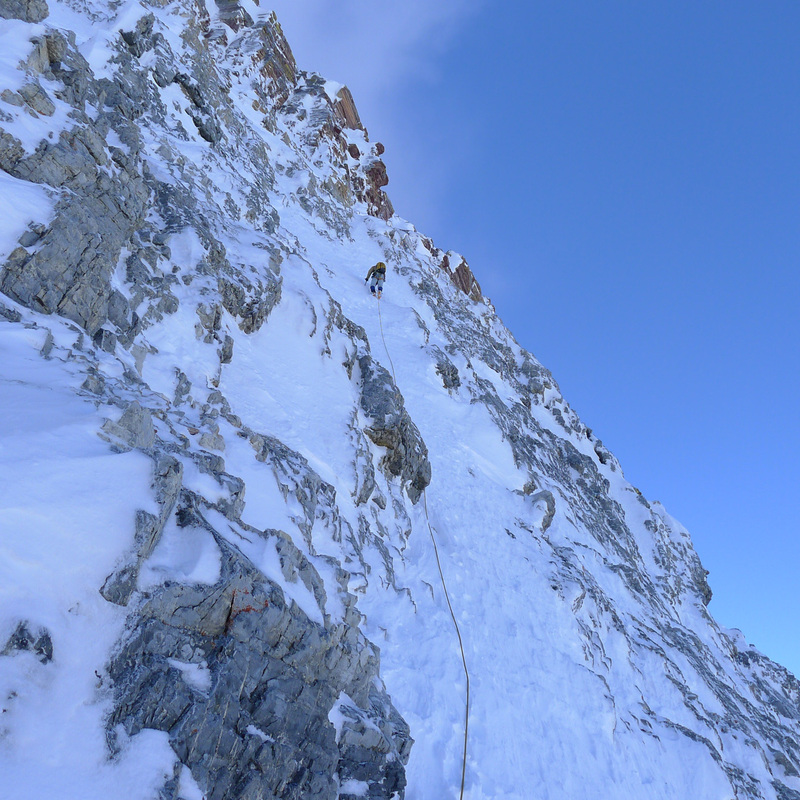 It’s a nice alpine ice climb, 8-10 pitches in length, that steepens as you get higher. 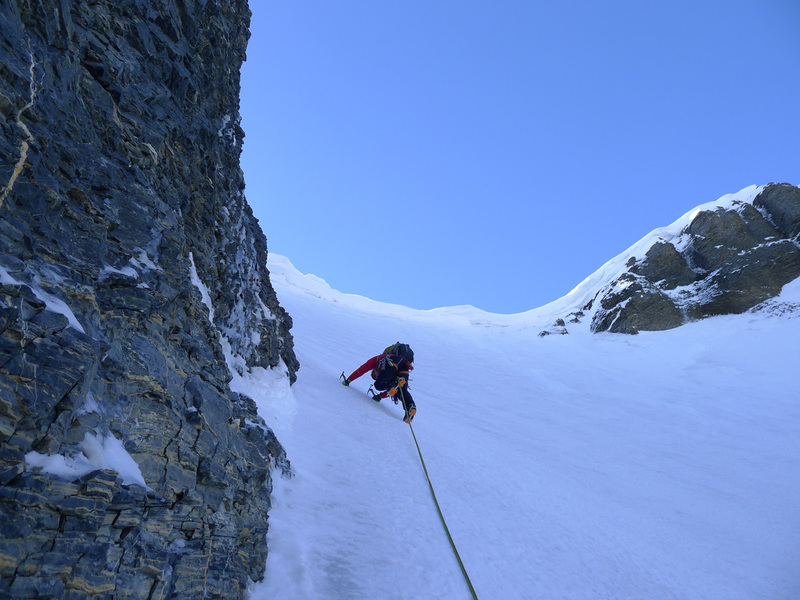 It was mostly straight forward front pointing, and the climbing was a lot of fun, and on mostly solid, good ice. 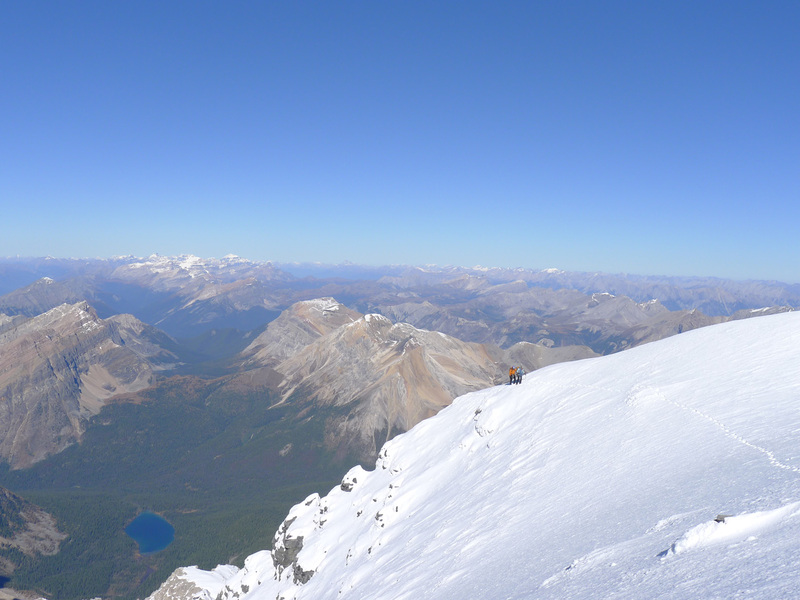 After we topped out on the gully, we decided not to go on and tag the summit of Andromeda, as we all needed to get back to Canmore. 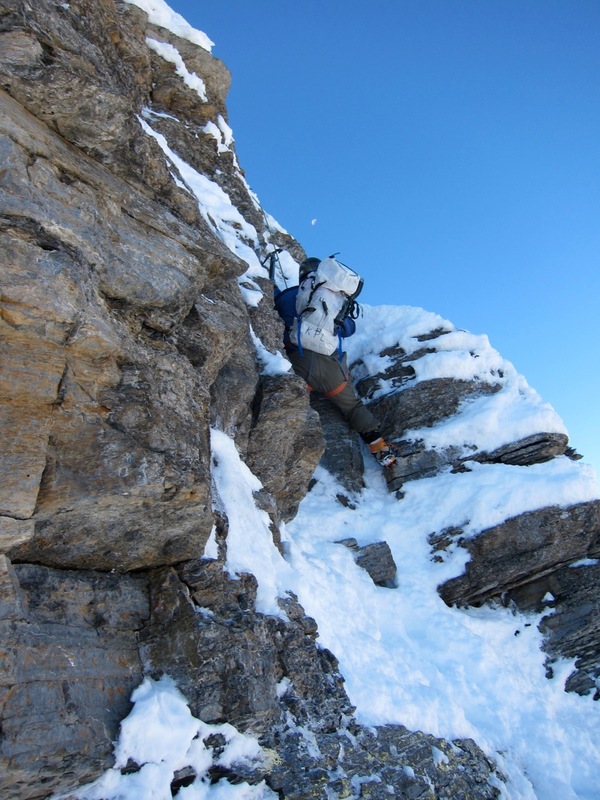 We descended down the AA col via a mix of traverses and rappels, and then made the long hike out to our car. It was a fun day, and a fitting end to my Canadian holiday.